This journey of a minister to reconcile his faith with the natural world and wonder and mystery has been a fascinating read for me. Check this out. I'm reading this book at the recommendation of a good friend, Jon Hart. 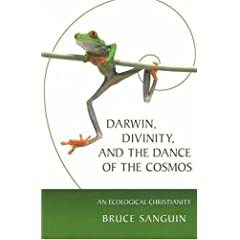 Author Bruce Sanguin is minister of Canadian Memorial Church & Centre for Peace in Vancouver, British Columbia. Many churches negate these experiences, risking disassociation with the natural world and God’s involvement. Some overemphasize them, risking spiritual narcissism. Sanguin’s call is for re-connecting the Spirit of God within, above, below, behind, and in front of all creation, and this is his foundation for the book as he builds on an ecological ethic. I’ve not finished the book and don’t agree with his total package, but finding this a worldview expanding and intellectually recharging read. *He had referred earlier in the chapter to experiences that are variously called miracles, supernatural, random, coincidence, what Carl Jung calls “synchronicity”–no, not talking about the Police/Phil Collins CD. Sounds interesting. I’m going to throw it in my Amazon shopping cart to get later.